When Billy and his two best friends, Maura and Roy, are invited to Grandma Meg’s beach house, strange things start happening. Grandpa Hugo, who has been missing for years, is talked about again, and an underwater arch is discovered down by the beach. The kids, being curious, decide to swim through it. Without warning, they are transported to a strange new world called Pyranis. There, the kids meet a twelve year old girl named Talia. With Billy’s dream dragon on the verge of hatching and dragon hunters threatening to steal it, Billy needs all the help he can get. 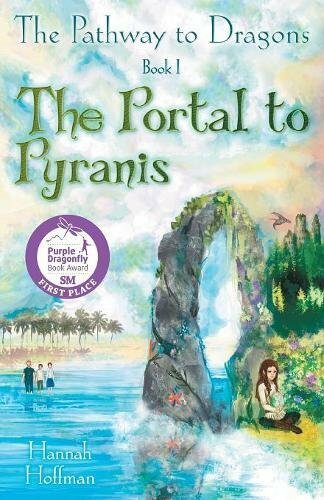 The Pathway to Dragons: Portal to Pyranis was a short, action-packed tale of true friendship and bravery. In this book, Billy must put his trust in Talia, a girl he just met, to help him get his dragon back. I thought that the characters were well developed and sweet. This book had great detail and easy to understand words, which will be helpful for a younger audience. I thought that the author wrote with such character and charm. The characters seemed to jump off the page and fly around me. The drawings were exquisite and really caught my attention. They flowed beautifully with the well-written book, really helping me understand what was happening. The twist with Grandpa Hugo was superb. He was a wonderful sort of mentor character, but he wasn’t the basic old and wise kind. Grandpa Hugo was brave and very strong. My personal favorite character was Talia because of her bravery and independence. Her backstory revealed in the end was a stroke of brilliance. In all, I thought this book was very well written, and I would recommend it to many eight, nine, or ten year olds who love a great adventure. This book was sweet and didn't have anything offensive in it.